Dramatic,glamorous, long, curly, wavy, wet look, gypsy style layered, shag wig, which is 22 inches in length. See item details for available colors. Dramatic Long wavy hairstyle, 32 inches in length. Featuring a natural looking skin top without bangs. See item details for available colors. Premium quality, short, straight, up swept costume wig! Perfect fun style for men or women. Could be Bart Simpson, Don King look alike or an exotic beauty, depending on the accessories and your imagination. See item details for available colors. Ultra premium quality featherweight wig! Hand tied monofilament top, which is 5 X 6 inches in size! For the most natural looking appearance, a monofilament wig cap construction is the ideal choice. Featuring the illusion of skin where the hair is parted, they are virtually undetectable to both the wearer and others. 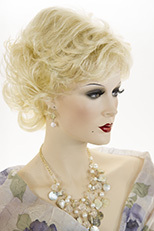 Monofilament wigs are perfect for those experiencing hair loss due to medical conditions. This stunning wig is so lightweight and natural looking! Rich, blended shades of blonde, red and brunette. See item details for available colors. Inspired by 60's behive hair styles like Precilla Presley. 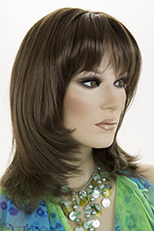 Premium quality, long, mid length, straight black behive style costume wig with long soft bangs. The hair is made from the finest modacrylic, Eleora fiber. See item details for available colors. Classic medium short length, straight and sophisticated! Short, straight bob with bangs. Featuring, a natural looking side skin part, which is 2 inches by 4 inches in size. The length falls to the chin. See item details for available colors. Arty, short, straight, razor cut which falls to the collar with bangs. Featuring a natural looking center skin part. The hair is 10 inches in length with bangs, which are 6 inches long. See item details for available colors. Layered, longer length, dreadlock hair without bangs! Try dreadlocks without the commitment. Great for a night out and a quick fashion change. The hair is made from the finest Eleora fiber. See item details for available colors. Priceless by Aspen! Luxurious, short, wavy, curly, layered hair, 100% Hand-Tied with a mono top. Length: Bang 4", Crown 4", Nape 2", Sides 3 1/4" The monofilament top, is hand-tied on a see-through mesh, which allows the scalp to be seen as it would appear naturally. 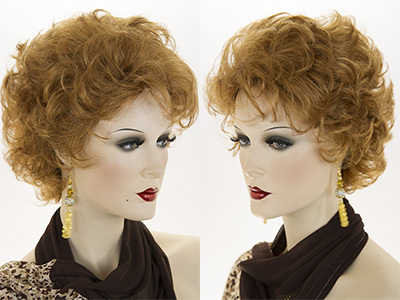 This natural-looking front doesn't show wefting, which may be seen on machine-made wigs. 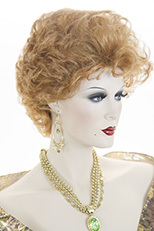 Monofilament wigs may be worn by those with or without hair and give the most versatility for styling as one may part the hair in any direction. The premium modacrylic fiber hair has many colors blended to give a perfectly natural appearance and the texture looks just like human hair, but with the style permanently baked in for added convenience. Glamorous! 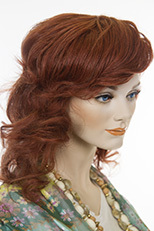 Long layered wavy showgirl style wig. The length is approximately 23 inches. Classic cap with wefts. See item details for available colors. 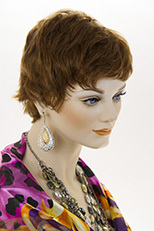 Youthful, short, spikey razor cut, shag style wig! Reminiscent of Liza Minelli and early David Bowie. Fun chic style. See item details for available colors.